Yes! There really is a Mel! A promise was made to Mel by her husband Jack, to one day put her name in lights. In 1992, that promise came to fruition and a successful American Dream opened its doors, instantly becoming a landmark in Lafayette - Mel's Diner. 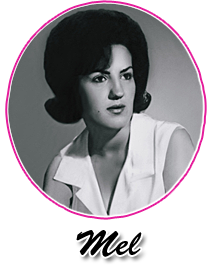 Mel grew up in Lafayette during the rock-n-roll era when the kids were doing the twist, the stomp and wearing pompadours and poodle skirts. Her love for music and dancing earned Mel the title of "Best Dancer" among her friends with a closet full of jitterbug trophies to prove it. With a bee bop in her step and an undeniable joie de vive, Mel caught the eye of her one and only - Jack. He grew up in the small town of Mansura, Louisiana and proudly served in the U.S. Navy, stationed at the embassy in Paris, France. The G.I. Bill led him to Lafayette where he graduated from S.L.I. (U of L - Lafayette for you youngsters) with honors. 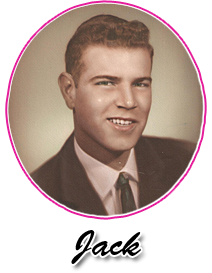 Upon graduation, he began working for a local burgeoning restaurant and in 1963, Jack was part of the opening crew for the local restaurant in the very location where Mel's Diner stands today. Not only did Jack fall in love with Mel, but he fell for the restaurant business too. Jack and Mel eloped soon after they met and the young couple spent their honeymoon delivering pies from the commissary to the restaurants. This commitment to hard work and spontaneous good times rolled for the next thirty years. Jack continued working for the local restaurant, rising to president and opening 76 locations in eight states and was in top management of a merged firm, with responsibilities in 18 states. Eventually, Jack left the company and franchised the four locations in Lafayette. During these decades, there were exciting changes in the industry and Jack learned good food as well as what customers like and expect. At home, Mel was busy raising and educating their three daughters in Lafayette and became a prominent volunteer for numerous civic organizations and school functions and committees. Jack and Mel had an established business in the community and the girls had gone away to college but together they dreamed of opening their own fifties 24 hour diner in their beloved Lafayette to share the experience of fabulous diner food and rockin music of those by-gone happy days. The opportunity to launch their vision presented itself and Mel's Diner was realized. Jack found himself back on Johnston Street renovating the same location he had opened thirty years before. On the walls, Mel hung Norman Rockwell prints from New York that she bought 15 years earlier, with her dream diner in mind. On another wall, Marilyn, Elvis, James Dean and photos of other stars of the era and circa pictures from the 50's. A quilted stainless steel back bar, a 40 year old corrugated stainless steel counter facing, neat sparkling stainless and chrome stools highlighted by HOT pink neon walls with the boom a rang pattern on the table tops. The menu featured the best items from all of the menus of the past, a daily blue plate special and dinner specials of full meals with a spicy flavor to satisfy the palates of their Lafayette clientele. The objective was simple. Great food, quick, but attentive service with the aim to please, just like in Ozzie and Harriet's day. Mel's Diner quickly became a favorite among locals. By the time Jack and Mel's third daughter, Shelly, graduated from L.S.U., she was ready to join the Mel's Diner krewe, offering a lifetime of experience as having been raised in the restaurant business. It didn't take long for history to repeat itself. Shelly eloped and married her college sweetheart, Keith, a young gentlemen from Rayville, Louisiana whom she had met at their alma mater. The honeymooners did not break stride and partnered up with Mel and Jack to open the second Mel's Diner location on highway 90 in Broussard in 1997. The stainless steel diner seemed to appear in one day with the same great menu, Norman Rockwell prints and 50's décor with a rockin soundtrack. So now you know the story behind Mel's Diner. Come in and take a look around at either location and enjoy the world's best biscuits or a delicious blue plate special. You will find the best food we can serve at affordable prices in a wholesome atmosphere. And you never know, Mel maybe the one sitting right next to you in a booth. God Bless America and Mel's Diner Too!